Amazon is changing the game when it comes to low-priced tablets. 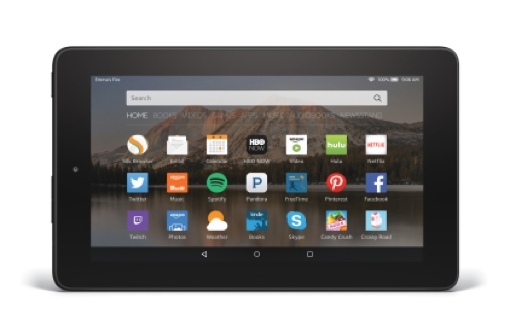 Today, the company announced the launch of the Amazon Fire, a capable 7-inch mobile device slated to retail for just $49.99. The new Amazon Fire runs the recently updated Fire OS 5 Bellini. Thus, the device comes packed with Amazon-friendly features, like the new Amazon Underground app store, parental control and X-ray for second screen TV watching. It’s also Family Library enabled, so you can immediately use your new tablet to share e-books and apps amongst all members of your household. Inside, the new Fire tablet has a 1.3 GHz quad-core processor with 1 GB of RAM (twice the processing power of the $100+ Samsung Galaxy Tab 3 Lite, Amazon brags), 8 GB of internal memory (expandable to 128 GB by microSD) and a 7-hour battery. The 1024 x 600, 7-inch IPS (in plane switching) has a respectable 171 pixels per inch. There are cameras on the device, too, but they’re quite basic: There’s a VGA front camera for low-res selfies and video chat and a 2-megapixel rear camera that shoots 720p HD video. The new Amazon Fire hardware won’t wow you the same way the new Apple iPad Pro surely will. But that’s OK – the focus here is delivering value. You simply cannot find a tablet of the Fire’s quality from a company whose name you’ll actually recognize for anywhere near $49. If you have a big family (or an institutional need), the deal gets even better: You can purchase a 6-pack of Amazon Fire tablets for $249 using coupon code FIRE6PACK at checkout. The new Amazon Fire starts shipping September 30. You can pre-order your tablet by visiting the Amazon website. Can I load an educational software on CD into this tablet? Will this be available with bumpers for small children?